Festival Theatre, Thu Aug 7. Everyone loves a party so there is no surprise in promoters actively touting Australia’s latest production of GREASE as the No. 1 Party Musical. Those old enough to line up for tickets to the 1978 movie remember fondly those Summer Lovin’ moments that made the film a mega smash, propelling its stars – John Travolta and Olivia Newton-John into the cinematic stratosphere and a permanent place in popular culture history. A decidedly disinfected version of the original stage show, the film’s success (apart from the music and spotlit American teen culture of the ‘50s) really came down to the ultimate teen love story between Danny and Sandy. The modern stage version is also seriously sanitised but retains its feel-good celebration of being young, free and finding a place and culture of your own. Unfortunately, film devotees may be left a little deflated by a script that seems to relegate the Danny/Sandy relationship to the bleachers. Although Rob Mills and Gretel Scarlett were in fine voice and made admirable attempts to channel the personas of Travolta and ONJ, there was little chemistry between the two onstage except during their final number, You’re The One That I Want. As DJ Vince Fontaine, Bert Newton was having a wonderful time and although he didn’t fit the role of suave and sleazy (as per Ed Byrnes in the film) his casting providing a brilliant slice of Australian radio history as Newton relived his early broadcasting roots. Miss Lynch, Headmistress of Rydell High provided opportunity for sing-along lessons at the beginning of the show, her character played beautifully gruff by stage and TV screen veteran Val Lehmann. John Paul Young’s turn as Johnny Casino was great fun, and a nod to Love Is In The Air delighted the audience. Yet the star power in the show really came from Todd McKenney in his high wattage incarnation of Teen Angel. Demonstrating exactly why he is an icon of the Australian stage, McKenney ‘camped’ like there was no tomorrow – all teeth, silver quiff and sequins. The audience lapped up his antics with McKenney milking his moment as only a true showman can. Other cast members of note were Stephen Mahy as Kenickie, whose Greased Lightnin’ number was a high octane showstopper and in particular Lucy Maunder who was able to capture the essence of the brash yet vulnerable Rizzo in her performance of the heart wrenching There Are Worse Things I Could Do. Special mention also needs to go to Eli Cooper who was fabulous as the hapless yet adorably hilarious geek, Eugene. The band – suspended above the stage amongst the stars – were sensational, as was the staging and magnificent costumes. Generally, the stage show itself is fairly average and although the cast could not be faulted vocally – and despite a few shining moments – the overall production lacked magic – enjoyable, but needing something more. 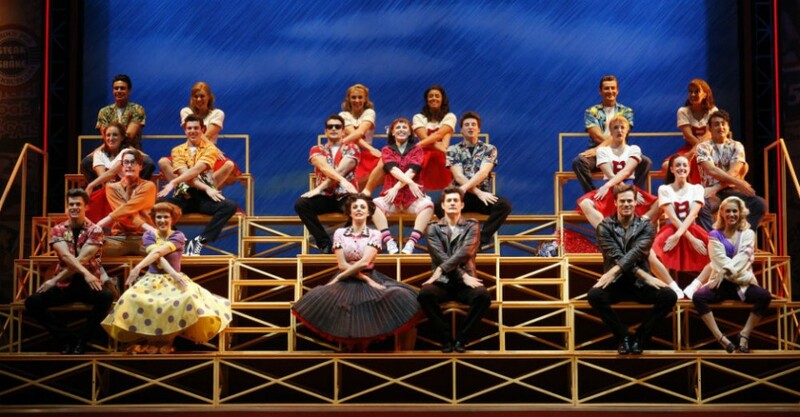 GREASE Is The Word continues at Festival Theatre, AdelaideFestival Centre, until Sun Aug 31. Rosie van Heerde is a high school teacher whose teaching passions include Visual Media, Drama and Photography. As an Educator, her joy is in fostering the same passion in these areas with her students. A lover of the Arts, Adelaide and "All Things Festival", Rosie began writing reviews for Rip It Up in 2004 and is thrilled to now join the talented writing team at The Clothesline. When not in front of a class or a performer, Rosie enjoys wine, travel and learning how to reverse-park her new caravan.